Micro Loop Hair Extensions Q&A: Are these different to micro ring extensions? The Same As Micro Ring Hair Extensions? "Are micro loop hair extensions the same as micro ring hair extensions?" Quite a few people ask about the difference between micro loop hair extensions and micro ring hair extensions (also called micro link hair extensions or micro bead hair extensions). The quick answer is that you end up with the exact same outcome - hair extensions secured with micro rings, but micro loop extensions come with the additions of... well.... a loop. The plastic loop is used to thread the hair through the micro rings instead of using a pulling needle. This means it's an easier application of micro ring hair extensions. Micro loop extensions are a bit like the microwave meal of micro ring hair extensions (see what we did there? Micro loop, microwave, micro ring? We’re winning at wordplay!). Microwave meals are ready-made and so are micro loop extensions because they come with all the fixtures and fittings attached to the hair: micro ring and a plastic loop inserted inside the micro ring so that the hairdresser (whether fully trained or not) can easily use the plastic loop to pull the client’s hair through the micro ring. The image with brown and blonde ombre hair shows micro loop hair extensions – the rings already are already attached to the hair extensions and the plastic loops are already attached to the micro rings (it feels like we should all start singing Dem Bones…the hip bone’s connected to the thigh bone…). At the end of the fitting process (which is outlined below) all that remains in the hair are the micro rings and the hair extensions - the plastic loop (and the tab attached to the plastic loop used to thread the natural hair through the micro ring) automatically detached once the hair extensions are attached. "How are micro loop hair extensions fitted?" 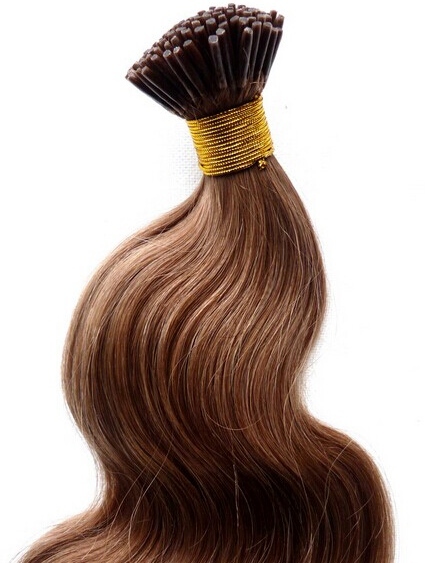 Micro loop hair extensions are fitted by taking a section of natural growth hair and using either your fingers or the tail of a comb, threading the natural hair through the plastic loop. Once the hair is threaded through the plastic loop, pull the small tab located near plastic loop which automatically threads the natural hair through the micro ring (which is already attached to the hair extension). At the end of the fitting process all that remains attached to the natural hair are the micro rings and the hair extensions, no plastic loops and no tabs. "If micro loop hair extensions have everything attached, what do micro ring hair extensions look like without anything attached?" 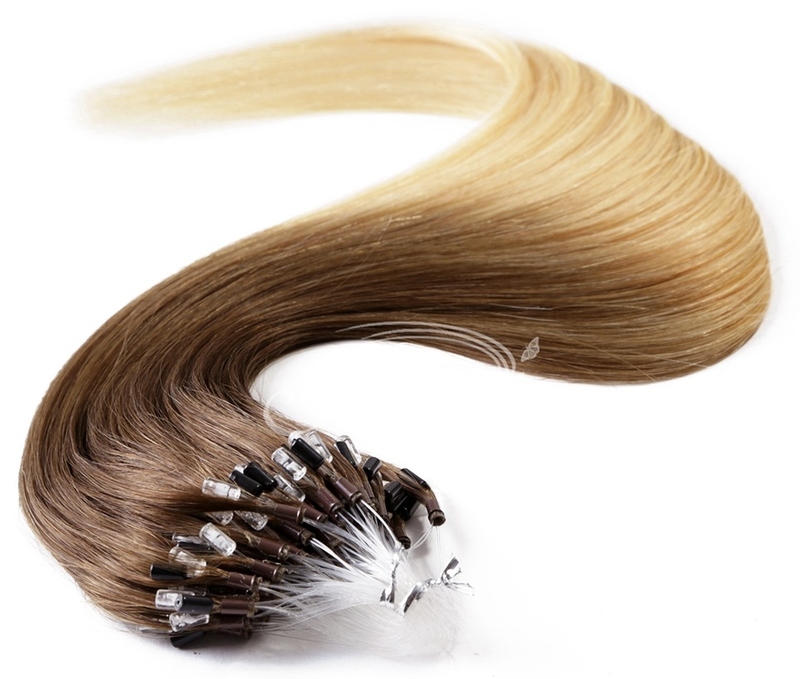 "What is the name actual hair extensions used in micro ring hair extensions?" Ah, that ol’ chestnut. Well they’re known by a number of names but most frequently as I-tip hair extensions and stick tip hair extensions because of the way they look and they're available in a variety of textures. "How are micro ring hair extensions fitted?" Micro ring hair extensions are fitted by taking a section of natural growth hair then threading the hair through a micro ring (aka, micro link micro bead) using a pulling needle; the stick tip (I-tip) hair extensions are then placed inside the micro ring alongside the client's natural growth hair and pliers are used to clamp (flatten) the micro ring which secures the client’s natural hair and the hair extensions inside the ring. At the end of the fitting process all that remains attached to the natural hair are the micro rings and the hair extensions. "How many times a day should I brush my micro loop hair extensions?" The prevailing advice is that you should brush or comb your micro ring hair extensions no more three times a day; this includes straight texture micro ring hair extensions as well as wavy textured micro ring hair extensions and curly texture micro ring hair extensions. For the first brushing or combing of the day, or as part of preparing your micro ring hair extensions for sleeping, dividing the micro ring extension areas of your head into sections means you can focus on smaller sections of hair to avoid catching the micro bead attachments. These three grooming sessions should include styling your hair in the mornings and if using heat styling tools on your micro link hair extensions, the hair extensions should not be over-combed to avoid excess shedding. There are a series of guides about how to care for micro loop extensions, including how to comb micro loop extensions as part of washing micro link extensions and as part of drying the micro link hair extensions. The micro link ring extensions should always be brushed before you before you swim. When brushing or combing micro ring hair extensions, the hair near the actual micro rings should be brushed and you can check out a step by step guide to combing micro loop extensions which also explains the best types of brushes to use so that bristles will glide over the actual micro rings and not get caught in them.